Okay. Listen. 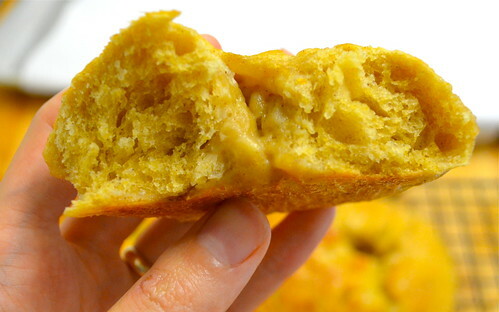 I have been saving, clipping and bookmarking pumpkin-themed recipes since about mid-August. I wish that was more of an exaggeration than the truth, but there it is. 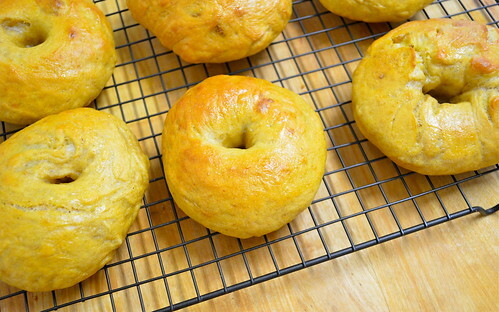 While I refrained from diving head first into all things pumpkin (precisely, until we got our first gorgeous Roughe Vif d'Etampes or "Cinderella" variety with our weekly farm share) until now, I was 100% dying to try my hand at pumpkin bagels. I don't know about you, but bagels, or breads of all varieties, really, tend to intimidate me. I'm not sure why. Maybe it's the many steps in the process, the finicky temperament of the yeast (though the ingredient list is usually quite short otherwise) or the fact that bagels in particular require the extra step of boiling before baking. While the exact reason is really unknown to me, it's also now completely irrelevant, whatever it was, BECAUSE: these came out AMAZING. I feel like I'm taking this a little too far and maybe, I don't know, even bordering on bragging about how fantastic these bagels were. But I think it's partially pure excitement at how legit they seemed (yes, totally the right occasion for the use of legit) and partially the combination of what ginger, cloves and cardamom can do to my brain. It was a win to the power of win. This particular recipe is definitely a weekend project, a wake-up-on-Saturday-morning-raring-to-go kind of deal. The thing about bagels, or any bread endeavor for that matter, is that it tends to be an all-day affair. There's even an opportunity to drag this out into a 2-day marathon baking session, if you just can't fit it in all in one day. Though after you get to a certain point, trust me, you should go on. These are wildly worth the wait. Okay. So brace yourself. Maybe do a stretch or two, because there's a long, glorious haul ahead. Start out by making your sponge. Combine 1 teaspoon of your yeast and water and let it stand for a few minutes. It's super important that the water isn't too warm or too cold, or you risk killing the super temperamental yeast. 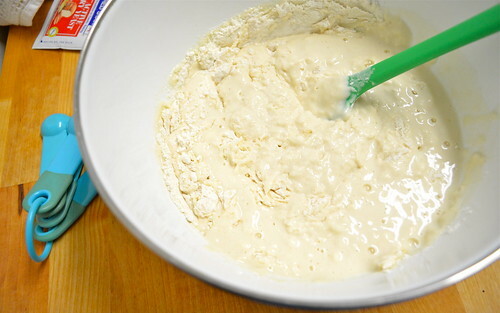 After about five minutes, gradually add your bread flour. You don't want to fully mix it but gently fold it into itself, until all your flour is damp but not completely combined. Cover tightly with plastic wrap and set aside for an hour or two. Note: it's super important to go for the bread flour and not sub out for all-purpose flour. 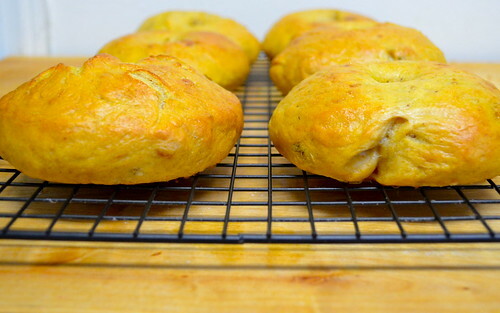 Bread flour is a high-protein flour that makes for a more elastic dough and a chewier texture to your bread, which is obviously perfect for bagels. 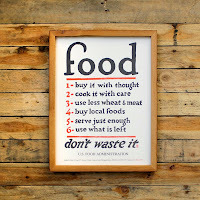 If you go for something like all-purpose, it will (ehhh?) work, I guess, but the rise and the texture won't be quite right. Bread flour is worth the splurge. 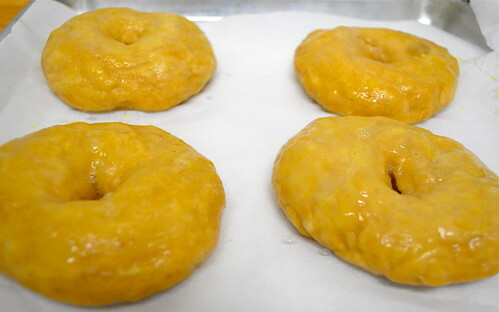 Especially since AFTER you make these you will 100% want to make them again. After an entire hour and a half of thinking about bagels (what, that was just me? ), it's time to prepare the main event: the dough. Begin by adding your second teaspoon of yeast to a small amount of room temperature water (about 3 tablespoons, ish). Set aside for about 5 minutes. 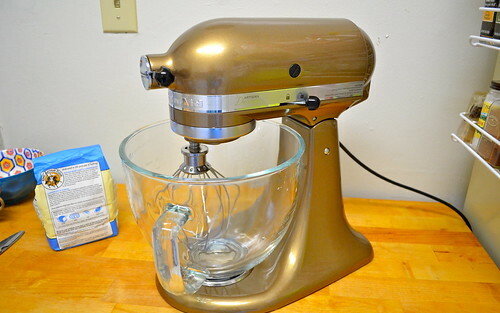 Since this was the first recipe I used to christen my new, beautifully shiny gold Kitchenaid stand mixer (swoon and swoon again), I set it up with the dough hook attachment and got ready to rule the kitchen. 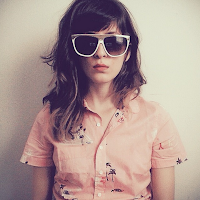 Is my immediate head-over-heels status too obvious? Of course you CAN attempt this recipe with hand-kneading. It's absolutely possible, it will just take a bit of extra oomph. You know, the official word for giving it all you've got. 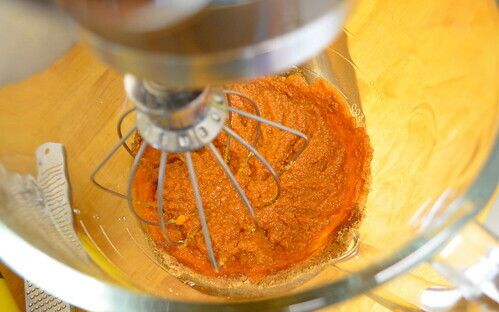 Combine your pumpkin purée, salt, brown sugar, cinnamon, nutmeg and ginger. And your small bowl of yeast and water and continue to run your mixture on a slow speed. Now it's time to gradually add your sponge mixture, which will now have a somewhat sticky quality to it. 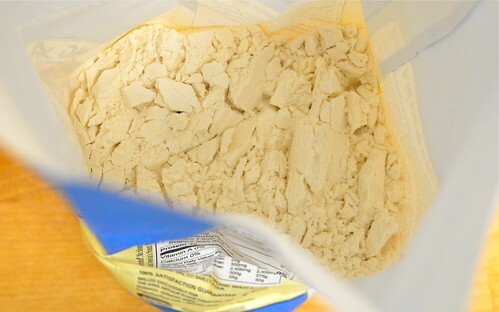 Once things looked pretty well mixed, it's time to start adding your 3-4 more cups of bread flour. It's recommended to add this flour in 1/2 cup increments, since you won't really know how much you'll use until, well, you use it. I ended up using all four, though I'm guessing this will all depend on your climate, location, the rise of your original sponge mixture, etc. Around cup three I felt the mixture start to ever-so-slightly strain, so at this point it's a good idea to scoop your dough onto a (suuuuper well-floured) surface and have at it by hand. Let me tell you something, kneading bread-flour-based-dough is FUN. It's super stretchy and easy to work with, which made the promise of a bakery-worthy bagel all the more exciting. 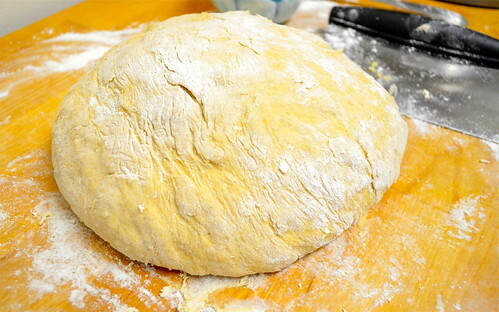 Knead until your dough starts to smooth out---it should be elastic but not sticky. Half the fun of understanding that is figuring it out yourself. Now it's time to form the bagels. This amount of dough should make about a dozen pretty huge bagels. (If you want to get particular, you can weigh out the dough in about 4 ounce pieces, but that's up to you.) I weighed the first few and then decided to just figure it out by sight, so we ended up with some huge bagels and some baby ones, but ended up with about fifteen altogether. I can live with that. So cut up your initial dough into 12-15 pieces. Cover with a towel (doesn't need to be damp) for 20 minutes. I KNOW. MORE WAITING. BUT YOU'RE ALMOST THERE. 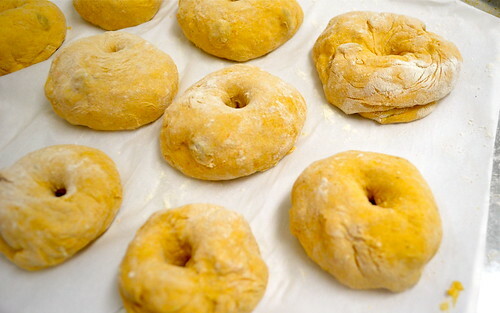 After 20 minutes have passed, it's time to make these dough balls look like actual bagels. While there's no right or wrong way to do this (I don't think), the easiest is to pinch through the center of each ball with your thumb, making a small dent and gently expanding that hole by rotating to the right (or left, if you're left-handed). 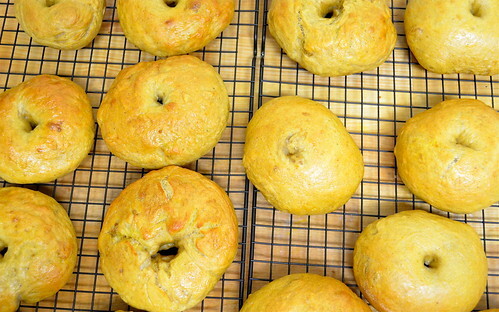 It sounds hard until you get through the first few; after that, you're a bagel-forming champ. As you form each one, place them on baking sheets that have been prepped with a layer of parchment paper. Let them sit at room temperature for 30 minutes. OKAY. LAST PHASE OF WAITING, I promise. Tightly cover each prepared tray with plastic wrap (lightly grease the side that's touching the bagels with some nonstick spray) and place in the refrigerator from four hours to overnight. Since I started this trek on a Saturday morning, I decided that four hours would do: seriously. After the longest four hours of your life, preheat your oven to 500 degrees. Since using an oven at this temperature is slightly unusual, you may wonder, does my oven go that high? It does. Most standard ovens make it all the way up to 550. Fill the biggest pot you've got with some water and bring to a rolling boil. Once it's really going, add your tablespoon of baking soda. 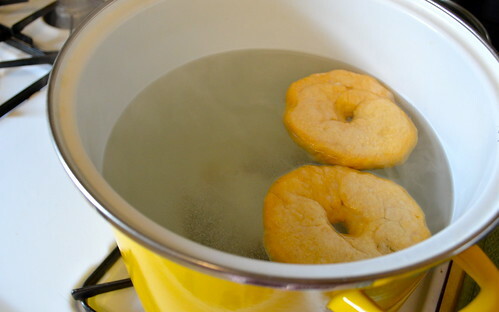 Taking two bagels at a time, drop them into the pot and boil for one minute on each side. The easiest way to flip them is with a large, slotted spoon. After each round, return them to the prepared baking sheet (still just parchment paper) and gently brush with your egg wash. This would also be the time to add your brown sugar topping if you plan to, though I skipped this step. Baking six at a time, bake for 6 minutes, then rotate your pan, reduce the oven temperature to 450 and bake for 8 minutes more. At this point, you have officially made bagels. It might have taken you all day (or all of two days), you might be tired, it might not officially be breakfast time anymore (in fact, definitely not), but who cares. They're glorious with a slightly orange hue. They've got an amazing spiced aroma, nutmeg-y and gingery and only slightly sweet. Total win.